We’re set for a damp, unsettled weekend according to Met Éireann. A STATUS YELLOW wind warning comes into effect this afternoon in six counties, as we’re set for a changeable and unsettled weekend. Southerly winds with gusts as high as 100km/hr will hit Atlantic coastal counties this evening, with the warnings in place for Donegal, Galway, Mayo, Sligo, Clare and Kerry. Met Éireann has forecast outbreaks of rain and drizzle this evening, with the potential to turn persistent and heavy in the west and north-west. There’ll also be a wet and blustery start to the weekend tomorrow, with rain widespread throughout the country. Temperatures will reach the teens, however, ranging between 12 and 14 degrees. The rain is then set to clear into Sunday, but then return again as the new week begins. 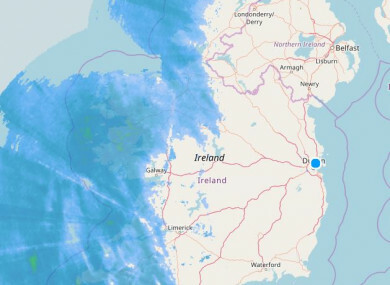 “The weather looks set to remain changeable and often unsettled throughout next week with areas of low pressure moving towards Ireland from the Atlantic bringing further spells of rain and strong winds,” Met Éireann said. Email “Wind warning in place as we're set for some heavy rain this weekend”. Feedback on “Wind warning in place as we're set for some heavy rain this weekend”.